These Moet bottles took 3 weeks to get right, but I was determined to have them in my game. They look good all around and have a half tile foot print so you can put them on almost any surface. I made Minion bedding for the Sims 2 and after the new film this year I decided the kids were a bit left out in my game (not that I play any). So here are ten single Minion mattresses for your ankle-biters. The mesh is by annachibi, here is what it says in the description- Sleep in comfort with this single-sized mattress that can fit on any bed frame. Separated by annachibi with S4S. Ever wished you had more colour in your life? Yeah me too. I started to make the Gothic fireplace, but was never satisfied with the result, in a moment of bemusement I covered it in bright glass bricks. WOW! Well I'd started and had a few more similar textures so I carried on, realigned the UV (3 times) and what you see is what I got. Works perfectly and makes me smile. 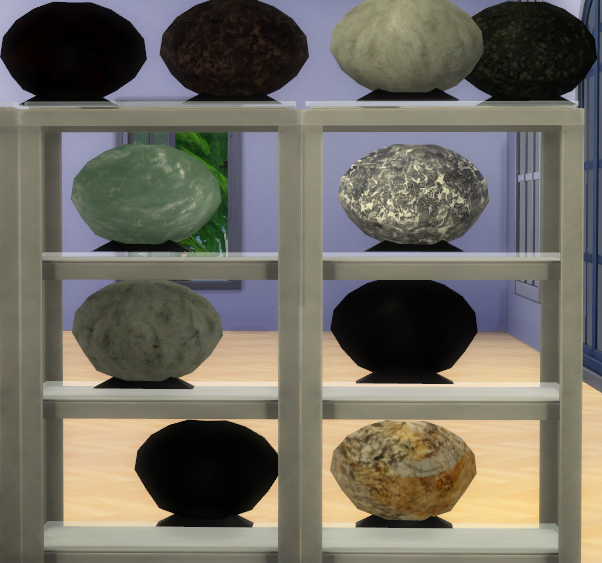 A few months ago me and the Rock Star were on line looking for inspiration for new objects. We found a picture called Gothic bedroom. I loved it and set out to make some of the items. The first was this bed. It's not a perfect replica but I'm happy with this version. After tweaking it to within an inch of its precarious existence it's finally ready for the outside world. There is a dresser and side table in matching fabric in another post. All the bed fabric apart from the giraffe texture and the chocolate leather is velvet, there is bronze & white marble too. The bedding is my own design so please don't take it and use on other beds, thanks. 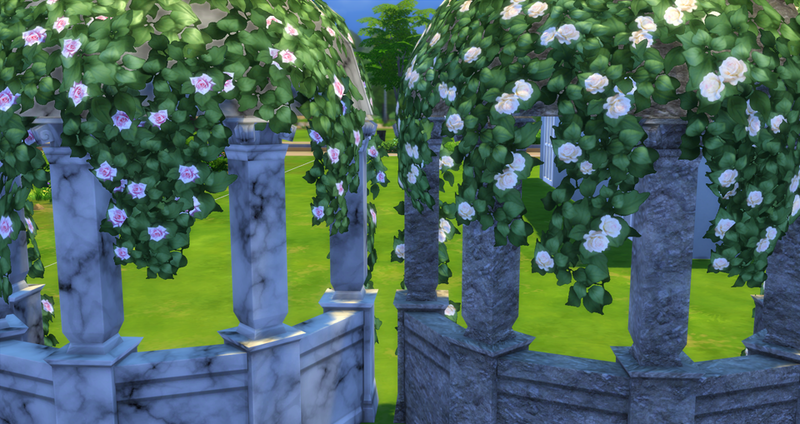 The Sims will walk through the side to get in it but it doesn't affect any part of its working. Its a bit of glamour and/or off the wall bedroom dressing. 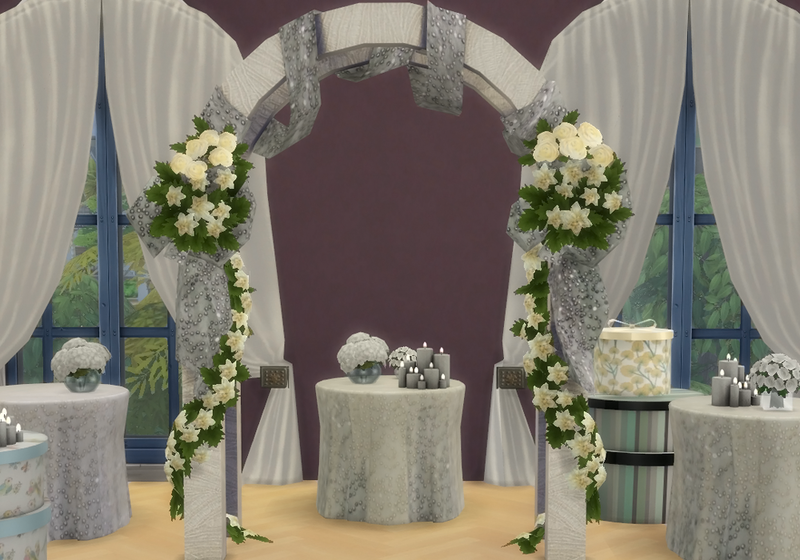 I tried to use textures that would fit rooms across the board. Sorry for all the pics, I wanted to make sure you knew what was in the file. 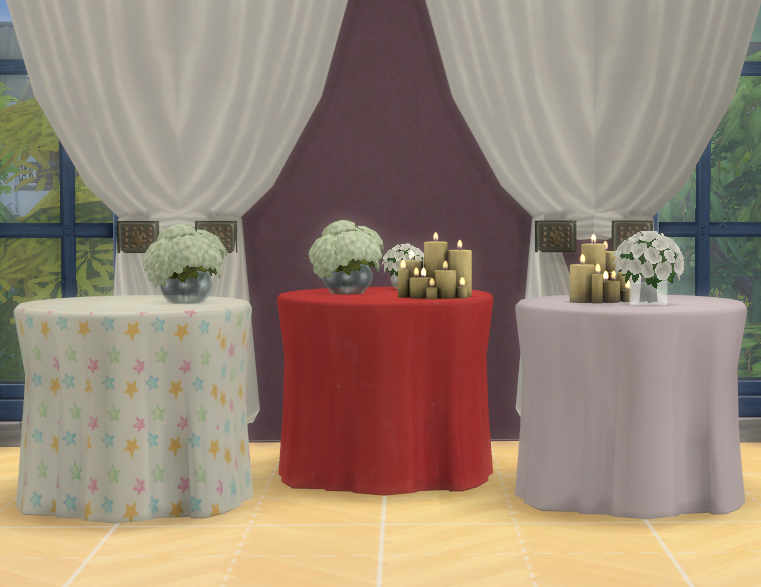 The tic tac side table in re colours to match the Goth Bed and others just because I felt like it. Lots of velvet involved. I wanted some clutter for my girls so I thought hat boxes! I have always loved Cassandra's boxes so I made some for this game. Not all patterns will tile seamlessly as you can see from the yellow box, but I'm happy with these as they are. By all means re colour to your hearts content, I just ran out of time and I'm sure you all have your own colour schemes. If you want to up load any where just credit me as the mesh maker, thanks. I love these, I took the pulse wall light and fiddled with the mesh to make pictures that act as lights. They are found in wall lights. I started with glamour then got carried away while watching old TV shows and films. There’s a light to suit all, even those in the detective career and the kids. They have a soft spectral glow when used alone. 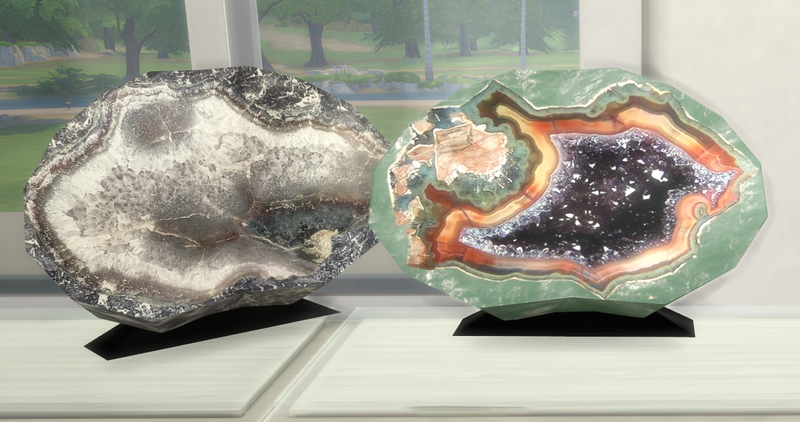 Made with the Sims 4 Studio picture mesh these huge pictures are really room changers. I am not good with wallpaper that builds a picture but wanted something dramatic to create different looks. The gnome in the pictures is for size comparison. The art is my own choice but feel free to re colour to suit your own decorating needs. If you re upload please give me a mention, thanks. This mesh is a converted sims 2 mesh by Jope. I could have made my own but I missed this book stack and could probably do no better than Jope. It took a while to get right but here are 5 different book stacks. Terry Prachett, Cookery, Old classics, Children’s tales and Fashion Designers. Re colour by all means but please say the mesh is credited to Jope, I just did the conversion. Thanks. 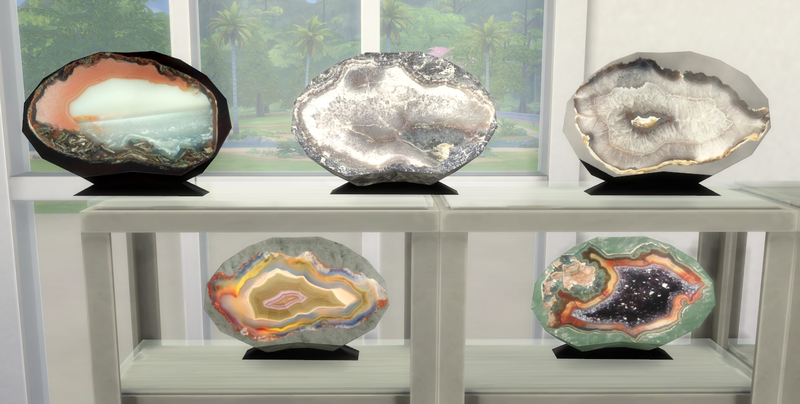 Hi, I wanted something for my lab and the houses of my science/biology Sims, so I made some geode slices. 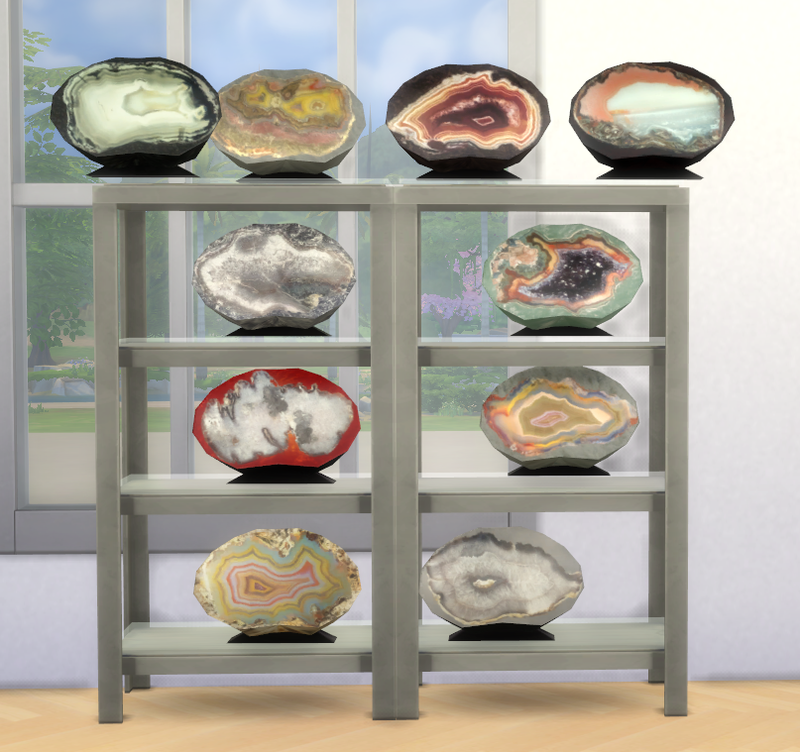 They are mostly agate and crystals. I may be wrong as although I did take notes I'm not a geology master. They are quite detailed when you get up close and have a shine across the front to mimic the real things. They sit anywhere as they were cloned from the pitcher (my old standby). 200 bucks found in cutter. I hope they come in useful. 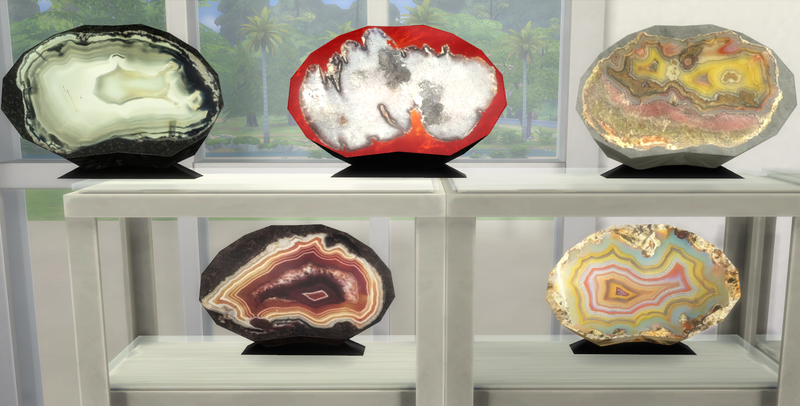 A few more deco bits for your lab or home. 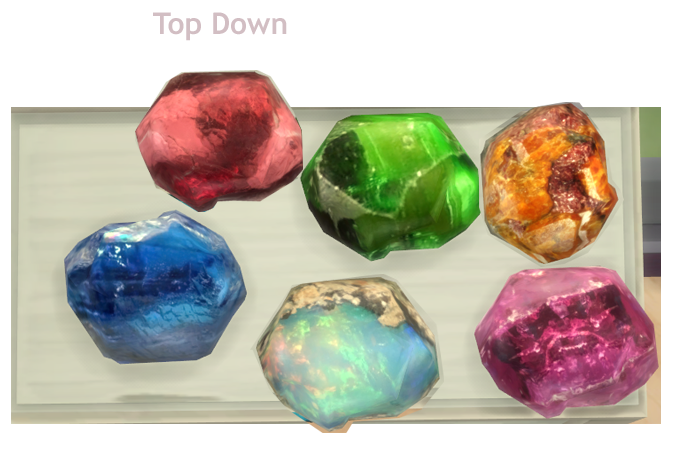 Six raw gemstones, Emerald, Ethiopian Opal, Sapphire, Spinel-merah (red), Spessarite Garnet (orange) and Rose Quartz. I read that spinel-merah is more expensive than diamonds and very rare which is why I chose it over a ruby, which we already have in the game. 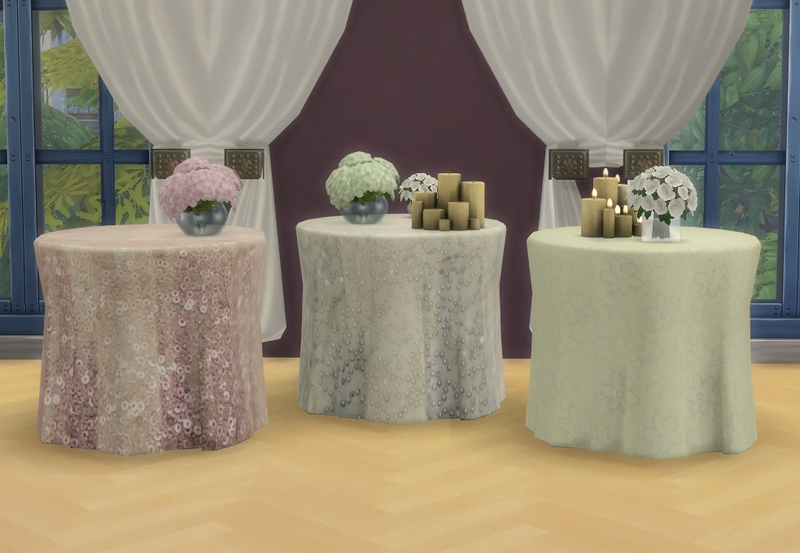 They really are pretty and I was pleased to have kept a lot of detail in the textures. 200 bucks because well they are gemstones, found in clutter. Spring is (OK will be) in the air and it usually brings with it weddings. 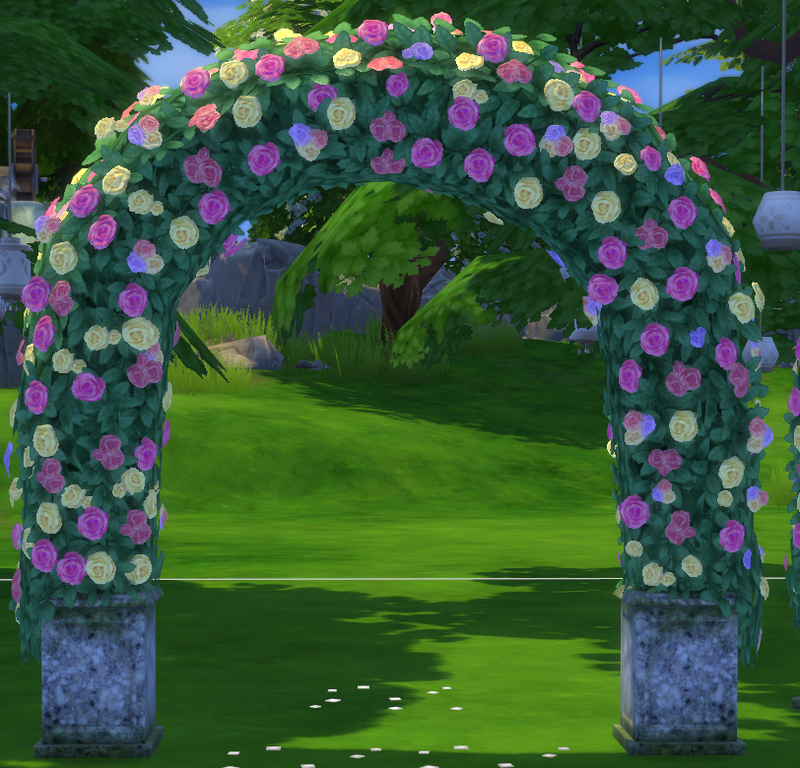 So here are a few new choices for the wedding arch. 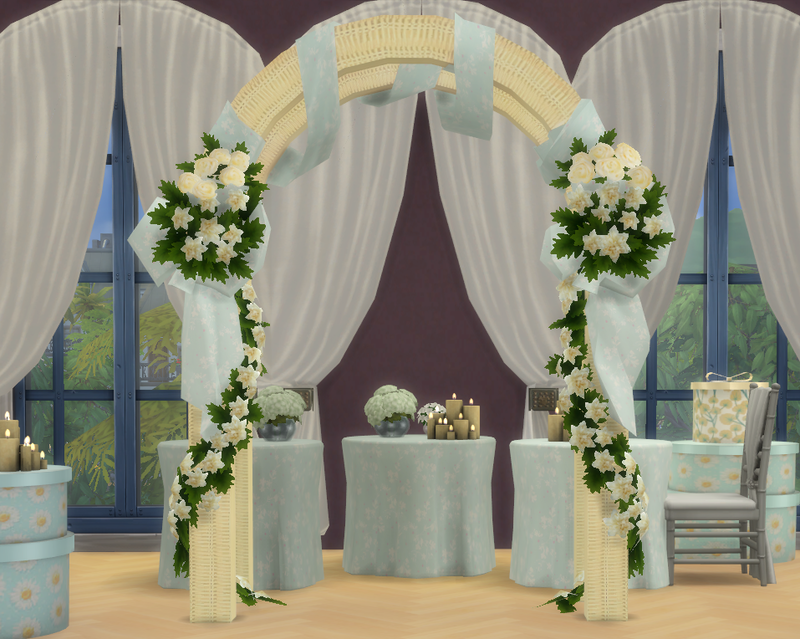 I have played with the mesh a little, moving the flowers and thinning out the ribbon. But the best bits are the new colours and textures. I am really pleased with they way they turned out. 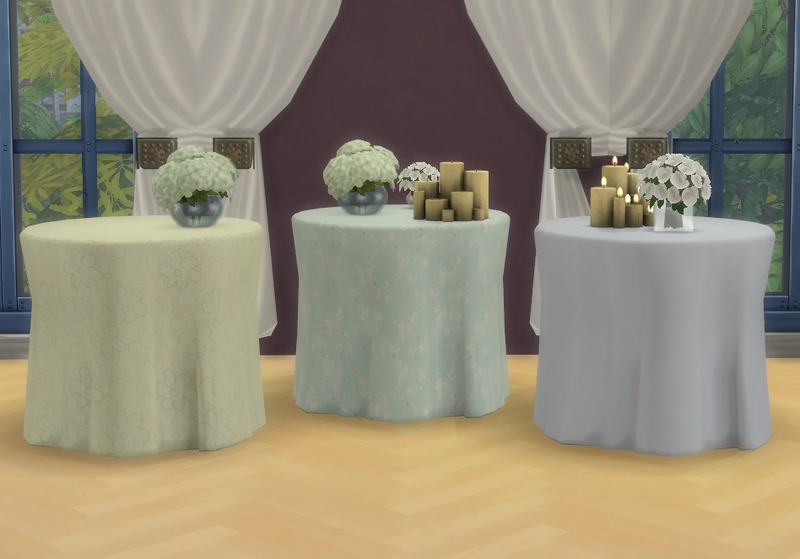 There are some little tables that match, seen in the pictures and in a separate upload. 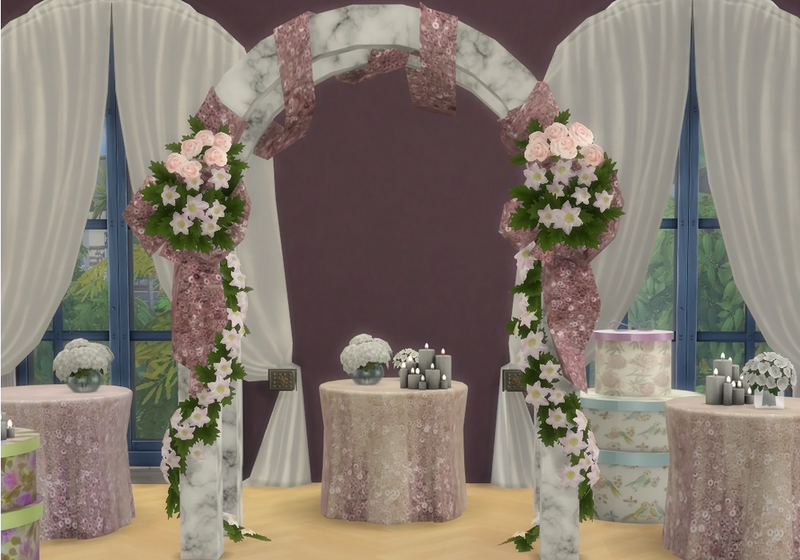 The flowers & candles are downloads from here, they are some of my favourite downloads; hat boxes are mine and are just above this upload, the bigger ones are still in the shed because they are being naughty. The curtains I don't want to talk about, I'll never get them the way I want them. Anyway, I hope these come in useful. 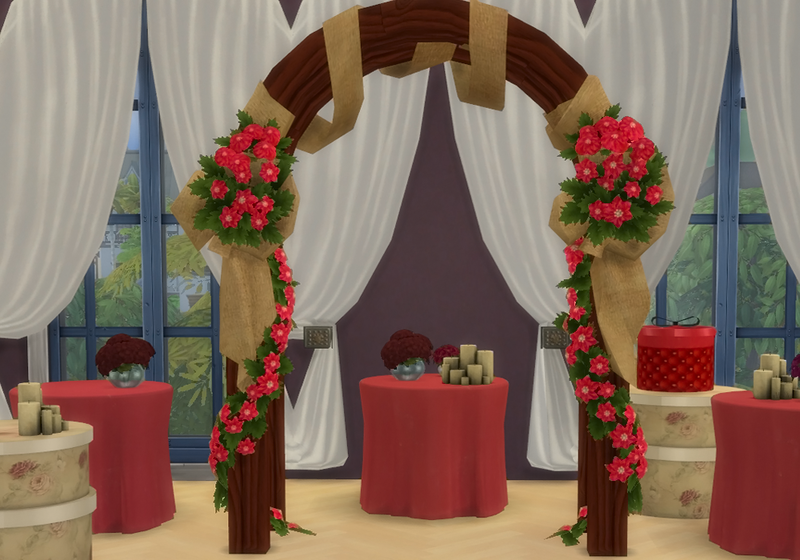 I recoloured these to match the wedding arch re colours. There are a couple of extras in there I think that are not in the pictures. The red has those marks on because its a velvet texture, looks good in the right light. 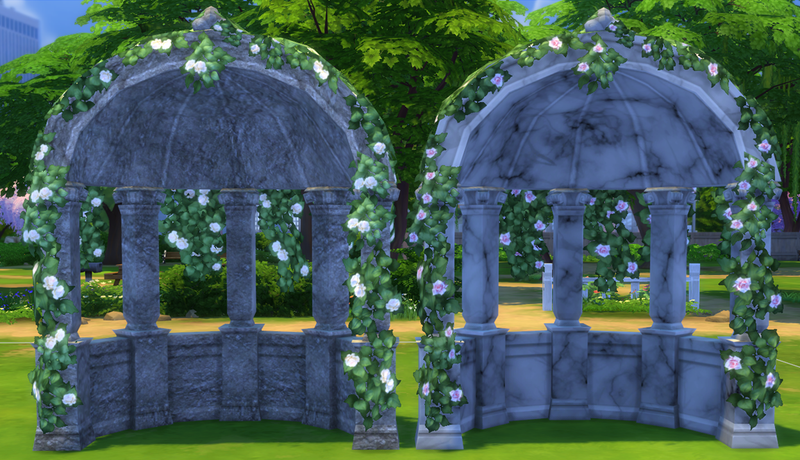 The first time I saw these I thought, they have to be wedding arches. 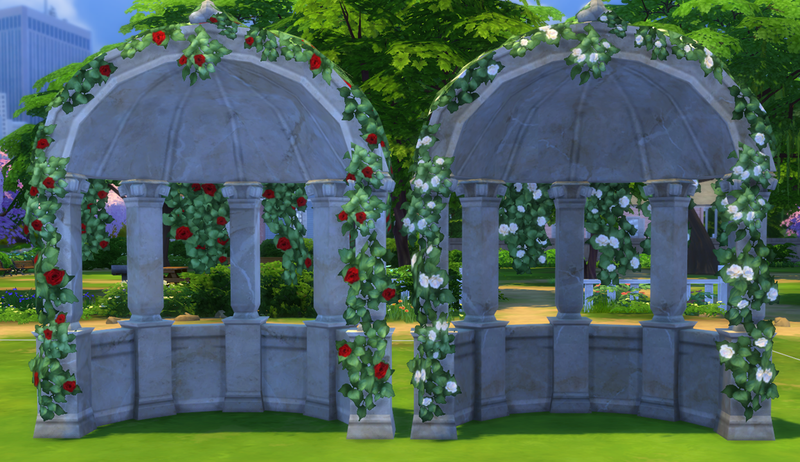 So after 4 days of intensive re colouring and learning math the hard way (for slots) here they are, all three arches converted to wedding arches. 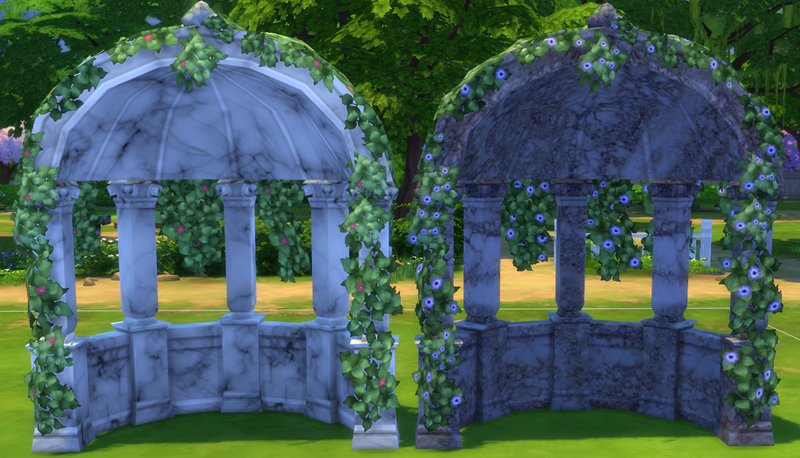 The folly shown is the only one that at the moment doesn’t have a deco re colour. But I will fix that if they are wanted. 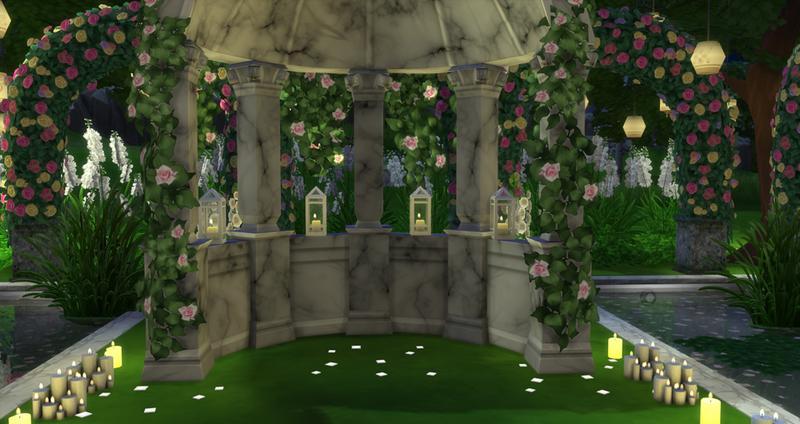 The Folly, with 12 small slots! The first time I have had real success with them. Six colours, including old stone for those who play medieval games. 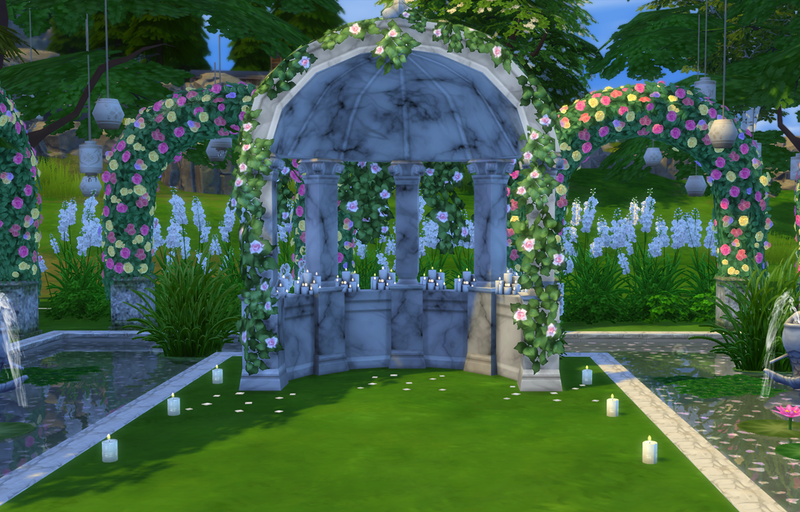 For the proper romantic wedding. There are 6 re colours here I think, I got a bit carried away trying to think of all the combinations that people might want. 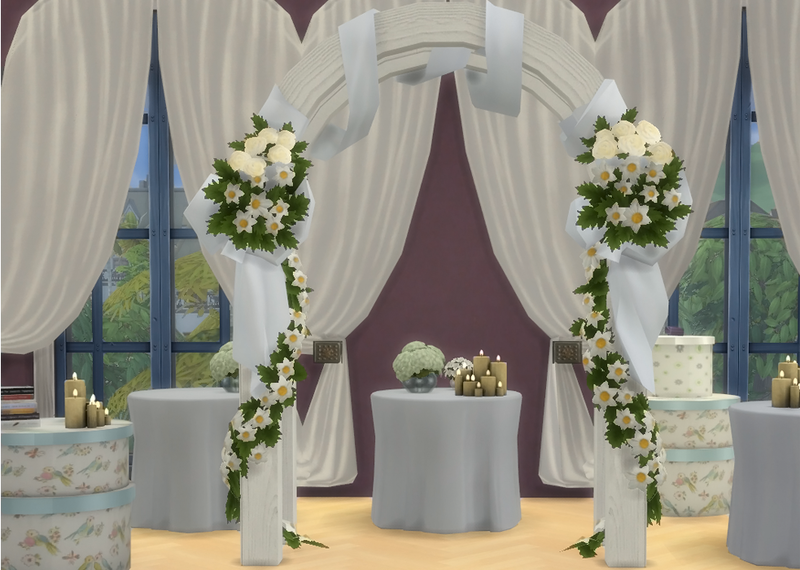 There is both the re coloured deco arch and the converted wedding arch in the file. They look great with the Folly above. Roses are my favourite flowers so I will be putting these everywhere.